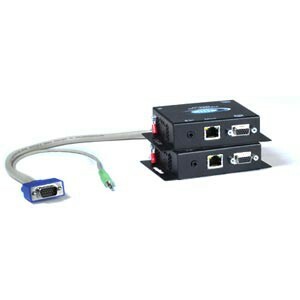 The XTENDEX® VGA Extender transmits VGA video up to 300 feet (91 meters) away from a computer using CAT5/5e/6 cable. 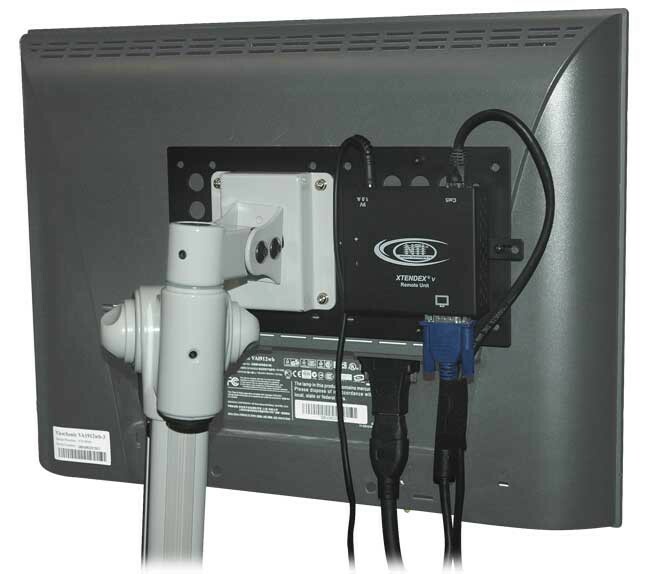 The extender supports local and remote monitors, and is available with optional stereo audio. Supports resolutions to 1920x1440. Also known as: VGA extender, cat5 monitor extender, remote monitor, video balun, extend video, VGA range extender. The XTENDEX® VGA Extender transmits VGA video up to 300 feet (91 meters) away from a computer using CAT5/5e/6 cable. The extender supports local and remote monitors, and is available with optional stereo audio. 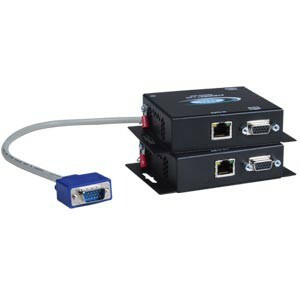 Supports resolutions to 1920x1440.The XTENDEX® VGA Extender transmits VGA video up to 300 feet (91 meters) away from a computer using CAT5/5e/6 cable. Each video extender consists of a local unit that connects to a computer and also supplies video to a local monitor, and a remote unit that connects to a monitor. "We have been using your ST-C5V-300 VGA extender products for some time now and keep adding more because of the good quality and ease of use. The first use was for our Church Sanctuary to run the 3 monitors on the stage for the singers and for the Pastor. We then added an additional extender to power the 42 inch LCD monitor in the hallway so that people that had to leave the sanctuary could still see everything on the overhead projector. "Recently we added two more extenders in the Fellowship Hall to power the 65 inch plasma TV/Monitor's and they work great. Later this month we will purchase another extender for the portable sound and video system we are building. "Keep up the good work and service." "I would like to thank you and your team for the wonderful experience we’ve had with NTI. When I called you early this week, we had been using a competitor’s product that they would not stand behind and we were in dire need of finding a new solution. Your commitment to help us find a new solution was outstanding. The fact that we were able to talk to your technical staff at length to make sure the solution would work for us speaks volumes to your commitment to your customers. "When we received your ST-C5V-300 it did not disappoint. The build quality was top notch and it worked as advertised immediately. The competitor’s product we had been using was more expensive, required lots of adjustments and was a poor quality in comparison. It was refreshing to see a product (and company) that we’ll be able count on for years to come. "You and your company’s professionalism and customer service has been some of the best I’ve had the pleasure of dealing with. After this experience, I wouldn’t use anybody but you for these products and will definitely recommend you to others." "We purchased two ST-C5V-300 VGA Video extenders for a recent computer upgrade in an on-air radio studio and absolutely love them both! What a great product, and flawless installation!" "I would like to thank Gabrielle and the entire staff at NTI for providing me with an excellent product (ST-C5V-300), tremendous service, and an overall wonderful experience. I was fast approaching a deadline and Gabrielle answered all my questions and returned all my calls. My project finished on time, thanks to NTI." "The ST-C5VA-300 works awesome – we have used cheaper units in the past but they are no match for the NTI product. We use them all the time to route Video and Audio from the back of the room to the projectors"